There are many varieties of summer squash, including zucchini, crookneck, sun burst, yellow and patty pan squash. 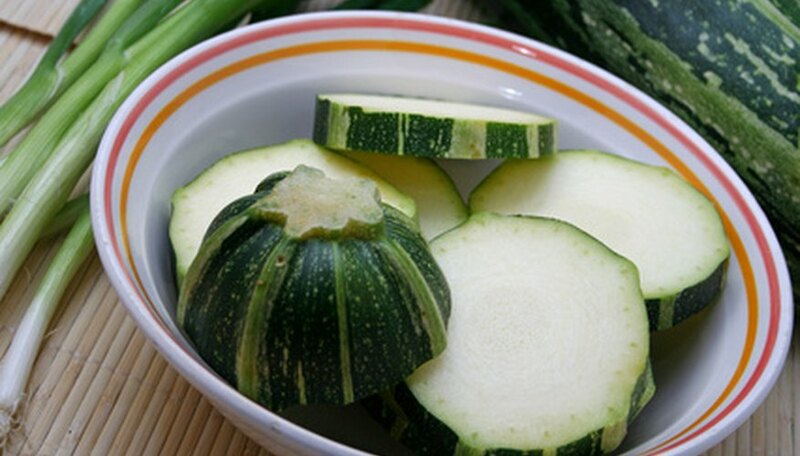 Summer squash is picked in the summer before it has ripened, whereas a winter squash is picked when it is fully ripe. Summer squash is eaten cooked, grilled or raw. Even the skin is edible in summer squash. There are differences between summer and winter squash and ways to identify the summer varieties. Feel the outside skin of a zucchini, a crookneck or yellow squash. The outside skins of summer squashes are tender, not hard. Look for summer squash during the summer months at local grocery stores. Winter squash is normally the only squash available during the winter unless you live in an area that has warm weather year round. Cut into a squash. The knife should slice into summer squash easily. It is much more difficult to cut into winter squash. Inspect the seeds in the squash. Summer squash seeds are soft and edible. Pick up a squash to test its weight. A summer squash will feel heavy and firm. Look at the color of the squash. A summer squash skin will look bright and have a shiny gloss. Eat a summer squash within a week of purchase, as it can go badly quickly. The tender skin of summer squash can bruise easily, so handle with care. When Should You Pick Rhubarb?